Handan is a historical and cultural city of China, and the birthplace of the ancient Zhao, dream, pottery and porcelain, and Taiji cultures. It is 420 km to Beijing in the south, and 390 km to Tianjin. Its tourist attractions include the Congtai Terrace in Wuling-the site of the Zhao capital, the ruins of Zhaowang City, the cave of the legendary immortal Lu Dongbin, Xiangtangshan Grottoes-famous grottoes in China, Nuwa Palace-the legendary site where Nuwa smelted rocks to make five-colored stones with which she patched up heaven, Tongque Terrace built up in the state of Wei during the Three Kingdoms period (220-280), the ruins of the Cizhou kilns of the Song Dynasty, etc. Handan is also the place of origin of many wellknown idioms and fables. There are more than 1,000 idioms originated from Handan. 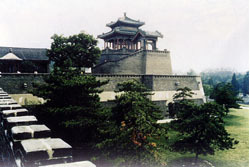 Yongnian is the birthplace of the Yang- and Wu-type Taijiquan, as well as the Taiji cultural center. The "Yongnian International Taijiquan Fellowship Promotion Party" is a grand meeting for domestic and international Taijiquan lovers to exchange experiences, perform Taijiquan and compete with each other.